One of the original Freedom Chair Trailblazers, Nerissa, is now GRIT's community manager! Her own journey with chronic illness has made her very passionate about helping other people get the most out of life in spite of a disabling condition. My ambition was to become the best climber, and I never did. I think that goal was a wrong goal. A better one is to put more emphasis on enjoyment, on getting a rounded experience, and on things like friendship rather than on sheer achievement. The Paradox Sports climbing team for the 2018 Gunks trip! In September 2018, I had the opportunity to take part in Paradox Sports’ annual climbing trip to “The Gunks” in New York State. The Gunks (short for the Shawangunk Mountains) holds world-class rock climbing opportunities. This was to be my first time climbing outdoors on a natural face since my mobility declined. 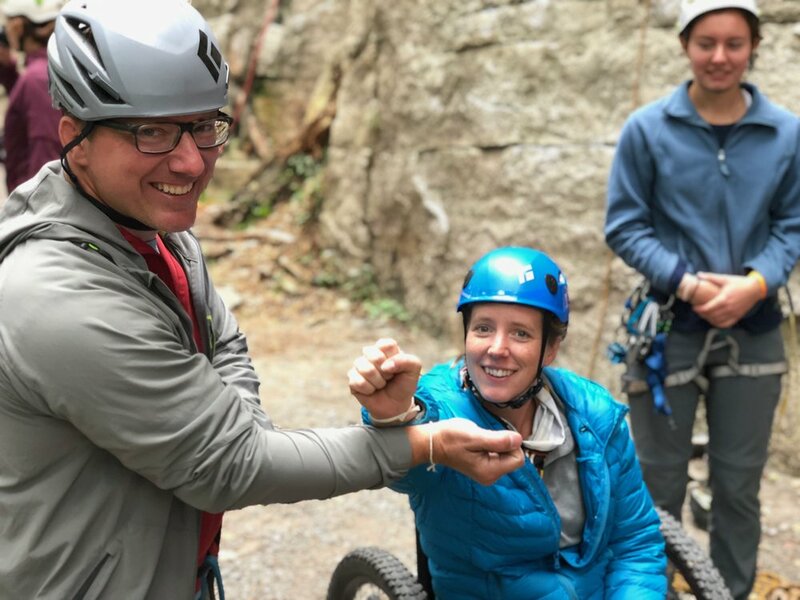 I couldn’t think of a better way to celebrate this milestone than by going on the adventure with fellow adaptive athletes. One of the beautiful things about rock climbing is that, in most cases, you won’t be able to do it alone. It’s just a given that you’ll generally need someone to, at the very least, belay for you. So, if you are stubbornly independent like me, a rock climbing trip is a great way to take the pressure off of needing to ask for some extra help. My first opportunity to accept some extra help came when carpooling to the crag from our campsite. I was a little nervous, but the guide I rode with had no hesitation disassembling and Tetris-stacking my Freedom Chair into his vehicle around all of his gear. Once he got me unloaded at the parking area, we all set out for our full first day of climbing. My friend and fellow climber, Shawn Sturges, making our way along the trail by the crag. Shawn is an exceptionally talented rock climber and is completely blind. The trail to the crag was wonderful! It is an old carriage road resurfaced with gravel—wide enough for a park ranger’s truck to safely navigate for maintenance or patrol. While the trail was wide and smooth, the gravel surface made it slick (especially on inclines), so I was very happy to have the stability of the Freedom Chair. The Paradox Sports team was an absolute pleasure. Such a selfless and kind group of people. I was able to get on the wall right from my GRIT Freedom Chair and the Paradox team made sure it was in a good position when I descended. When I couldn’t get close enough to the wall in my chair, they carried me! The two full days we all climbed together are now a blur of adrenaline, laughter, hard work, and smiles. What remains clear is the intense feeling of community I experienced. Getting stumped looking up at the smooth section of the wall that led to the ledge that was my goal. Perhaps my biggest takeaway from the weekend happened on the first route I attempted. There was a magnificent ledge at the top, and I wanted to get up there to sit and take in the scenic view. The first time I tried to ascend though, I couldn’t figure out how to get through a smooth section of the wall and turned to go back down. However, inspired by my friend, Shawn, who is completely blind and was able to make it to the ledge, I tried again. Once again, I approached the smooth section and felt stuck. At that point, one of the climbing guides was heading up the route next to me. He coached me through, gradually, and at one point said, “Normally, most climbers would use their feet to get up this spot, but that’s not your style.” It was like a light came on! Instead of saying, “Other climbers would use their feet, but you can’t do that” he said “it’s not your style.” Such a subtle alteration in phrasing changed the way I looked at things on that route and in everything I’ve done since. It’s not about doing things a certain way. It’s about finding your way (your “style”)—even if it looks different than other people’s. Sometimes, your method looks entirely different than even you thought it would, but that doesn’t matter. Find your own unique way to accomplish those things most important to you. I’m so grateful to my teammate for his simple statement that not only helped me attain my goal of sitting on that ledge, but it readjusted my entire perspective on overcoming difficult challenges. When it was time for me to leave, another one of the climbing guides walked back up to the parking lot with me. After two days of rock climbing, my arms were pretty tired, and it was all uphill away from the crag. At a certain point, he offered to help push me. I almost responded with my typical “No, but thank you.” However, I forced myself to apply the lessons I learned over the previous two days about teamwork, collaboration, and doing things in the way that works best for me. I accepted his offer, yet I still felt the need to make apologies for accepting the help. He simply stated, “No judgement here.” I told him, “I judge myself!” He then said another thing that’s stuck strongly with me since that trip. “Well, that’s on you.” He was absolutely right. My own negative judgement of myself and my abilities wasn’t useful in any way. All it did was keep me stunted and alone. The type of people I want in my life are not the ones who think less of me for working with someone to accomplish a goal. Climbing is a great game—great, not in spite of the demands it makes, but because of them. Great because it will not let us give half of ourselves—it demands all of us. It demands our best.